This ESL lesson plan contains activities and games for teaching the present simple to elementary level students. Use these as a stand-alone lesson plan, or to supplement an existing one. If you use an iOS or Android device, don't forget that you can get offline access to these materials, along with a much more extensive selection of ESL lesson plans, through the TEFL Handbook app. Use the board work below to step through the functional uses of the present simple. Students at this level should have an understanding of the grammar, so try to focus this lesson on its functional applications and elicit simple examples that demonstrate each. 1. evenings / do / like / you / what / to / in ? 2. Homework / when / you / your / do / do ? 3. of / type / like / music / do / you / what ? 4. studying / enjoy / you / English / do ? 5. you / friends / do / doing / with / like / What / your ? 6. any / do / hobbies / you / have ? Confirm they have the correct answers before dividing them into pairs. They will then use this list of questions to interview each other. For example: Boring, funny, serious, fun, friendly, amazing and clever. 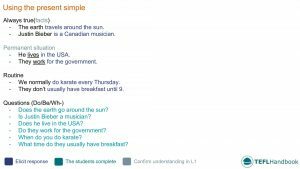 This is an excellent ESL writing activity that gets your students forming more complex sentences using the present simple. First, you'll need to confirm the students' understanding of the use of and, but and because and demonstrate how we use each one to give more information on something. Elicit or create examples on the board if you need to. Next, have the students write about things that they do during the summer that they don’t do in the winter. They should use the present simple for each statement and demonstrate the correct usage of and, but and because to give more information. The police drive white cars. Spain has a lot of beaches. BusyTeacher has a very comprehensive and well-laid-out article on teaching the present simple which would be an excellent place for new ESL teachers to start. If you're looking for more activity ideas, teach-this.com have a fantastic list of ESL activities for teaching the present simple. 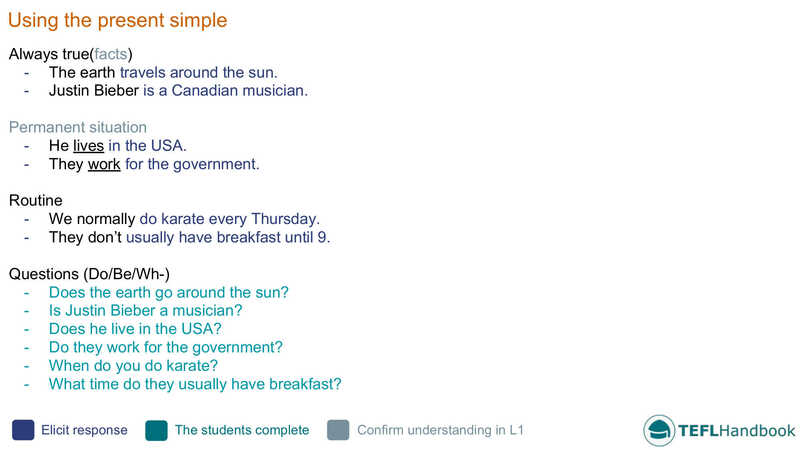 As usual, islcollective.com have some fantastic ESL worksheets on the present simple. For younger learners, we recommend 'Alfred's daily routine', while teenagers and older students could use these 'Present Simple exercises' to sharpen their grammar. Finally, if you're lucky enough to have internet access and a monitor in your classroom, you should try this video by Cambridge University Press ELT in your lesson. It works well as both a lead-in or revision activity. If you've found these ideas useful, be sure to check out our complete list of ESL lesson plans for elementary level students, A2 lower and A2 upper. For other levels, see the entire collection of ESL lesson plans. Our suggested next lesson is on personal pronouns. Also, Android and iOS users can access all of our materials through the TEFL Handbook app. An ESL lesson planner for English teachers.